Chronicling the process of building a Sienna model house with Ryan Homes and living in it. I spoke to Ryan Homes and their current service manager about the issue. The details of those conversations are included in the complaint copied below but I let it be known that I expected them to reimburse us for any parts that otherwise would have been covered had the unit been registered like it was supposed to. His response repeatedly was that it would be handled on a "case-by-case basis." He would not, however, commit to putting it in writing. Because of this I filed the complaint with the state. I've opted to redact the names of the service managers mentioned. "My wife Jennifer and I built a house with Ryan Homes in early 2014, closing on the purchase and taking possession on April 24, 2014. We were told at the time that the heating, ventilation, and air conditioning (HVAC) unit installed in our house would have an initial warranty of five years on parts from the date of closing, but we would receive an additional five years warranty (for a total of ten) because Ryan Homes would register the unit with the manufacturer, Comfortmaker. It was stated on their website (I have a saved image of the page verifying it) and was also verbally told to us by their service manager [name redacted] (after I specifically asked during our ten month review in February 2015) that Ryan Homes would handle the registration and there was nothing we needed to do. In late September 2018, we discovered a refrigerant leak on the air conditioning portion of the system. In the process of obtaining the parts for repair our contractor told us that we did not in fact have any warranty at all. After some research with Comfortmaker, it was discovered that contrary to what we were told the unit had never been registered for warranty at all. We were then told that the unit was only covered through late February of 2019, the date the installer purchased the unit from the manufacturer. Upon finding this out, I immediately called Ryan Homes and over the course of two weeks had several phone calls with their current service manager for our area, [name redacted]. He conceded that at a minimum the warranty should have started from the date of our closing. He then went on to say that Ryan Homes was aware of a period of time in 2014 when a number of HVAC units were not registered for warranty as they should have been. It should be stated here and emphasized that although they were apparently aware of this issue prior to us discovering it, NOTHING was ever communicated to us that we did not in fact have the warranty we believed we had. In addition, none of the neighbors we have spoken with whose homes were built in the same time frame received any sort of communication to this effect either. In February of 2019, a bearing on our furnace's blower motor went bad, causing our heat to malfunction. During the course of our contractor obtaining the parts, we were again told that per Comfortmaker our warranty would end during the end of February. I again had another discussion over the phone with [name redacted] at Ryan Homes. I expressed that I was concerned about the longevity of the unit given the repairs we had dealt with already (along with another repair the HVAC technician has told us to expect on the outside air handler motor) and again emphasized that I expected Ryan Homes to reimburse us for parts costs should something fail that should have been otherwise covered. Just like in October, he said this would be handled on a case-by-case basis. When I asked for clarification, he stated that this meant things not considered wear and tear items, but those that would have otherwise been covered by the warranty in years 5-10. He also told me that should something fail that would result in it being more cost effective to replace the unit versus repair to please contact him first because he would talk with the HVAC subcontractor they now use to see about getting us a new unit installed at a lower price. At a bare minimum I would like to receive in writing a declaration from Ryan Homes that any parts that would have been covered under warranty from April 24, 2019, to April 24, 2024, had the unit been properly registered will be covered in full without objection and repairs performed by a contractor of our choosing. While we appreciate the gesture made by [name redacted] to have Ryan Homes’ subcontractor install a new unit for us at a cheaper cost our concern is that in order to get parts covered they will make us use their contractor instead of ours as well." At this point we've received confirmation of the receipt of the complaint by both state agencies and are waiting for it to be processed/investigated. I will update on here as this process plays out. On a side note, I'm convinced the Comfortmaker brand is total junk. In addition to the aforementioned repairs we also had to replace the capacitor on the outside unit in April 2018. That at least was caught during routine maintenance before it could become a bigger issue. I have no doubt at this point that the clock is ticking down towards the next repair or premature replacement. It's especially frustrating because in addition to doing the recommended twice a year (spring and fall) preventative maintenance, we keep the temperatures around 67-68 in winter and 73-74 in summer. The unit has been taken care of yet it's still given us multiple problems. By contrast the Trane system at our old house, that ran far more, gave us one problem in the almost seven years we had it before moving and the Goodman system installed in my mom's home in late 2007 has given her zero issues since then. A few weeks go I finally got around to tackling a project that's been my to-do list since we moved in almost five years ago, insulating the garage door. It was fairly cheap, very simple, and seems to have made a difference temperature wise. There are a number of different kits available on Amazon and elsewhere. Most of them seem to be more or less the same thing, rolls of reflective insulation that tapes to the door. I ended up going with this particular kit that cost me just under $100 with free Prime shipping. It arrived on a Sunday morning around 11am and within a half hour I was out in the garage installing it. If it hadn't been for a trip to Lowe's to get extra tape I would have been done in about an hour or so. The insulation comes in four equal rolls, one for each horizontal row on the door. The kit says it'll cover up to 7x18 feet. Mine is only 16 feet wide so I ultimately ended up with some material left over. Installation was very simple. Put double sided tape around each door panel then unroll the insulation. Due to some dust and dirt I also wiped the door down ahead of time with a damp rag to ensure adhesion of the tape. One mistake I made (that resulted in making the trip to Lowe's was using two parallel lines of tape on the vertical sections of the door. I felt like it would provide better adhesion of the insulation but there wasn't quite enough tape provided for this. I picked up a $5 roll of double sided carpet tape that one of the reviews on Amazon mentioned and it worked perfectly for the sections I still needed to tape. I did one horizontal row at a time. After taping my wife held the insulation and unrolled it as I made sure it was straight on the door. To finish it off Jenny used a utility knife to trim around the hinges and lock. While I didn't use a thermometer to measure the temperature before and after it feels like it made a difference. A few days after installed it the temperature dropped into the mid teens over night and while it was still cold out there it seemed like it wasn't quite as bad as it had been in the past. It's only going to do so much however. It continues to annoy me that Ryan Homes did not insulate the exterior walls or ceiling of the garage where it sticks out from the house. (Despite me asking about it and even offering to pay extra.) I've since heard that from others that pushed much harder than I did and were able to get it done. I'd advise this if you're still in the build process. But I still consider it to be a worthwhile upgrade. Earlier in the year our garbage disposal died or so we thought. It started buzzing one day and then we heard a pop and caught a faint whiff of smoke. After that it wouldn't even make so much as make a noise when we flipped the switch so we figured it was just dead. We unplugged it under the sink and moved on. We really didn't use it much (we didn't have one at our old house so we never really got used to having one here) so it really wasn't a big deal. We just figured we'd replace it eventually. They're not that expensive, the model we have actually retails for about $100. The biggest problem we encountered with it not working was water draining from the dishwasher would occasionally back up in the sink. In that case reaching down to clean out small bits of food debris that made it through the sink strainer or plunging the drain with the rubber stopper was usually enough to clear it out. For whatever reason and I'm slightly embarrassed to admit it, it never occurred to Jenny or I that it might simply be jammed and in looking up the replacement I apparently overlooked instructions on how to fix it. On Christmas Day we happened to mention its lack of working to my brother-in-law who mentioned using the hex wrench and later in the day it came up in conversation again with my own brother who told me about the overload protector button. Sure enough that was all it needed. The one thing I did find was that an ordinary hex wrench did not provide enough leverage to move back and forth to free the jam. In my tool box however I had a 1/4" hex bit socket that combined with a 3/8" ratchet gave me the needed leverage to turn it. After that it started right up. Problem solved. 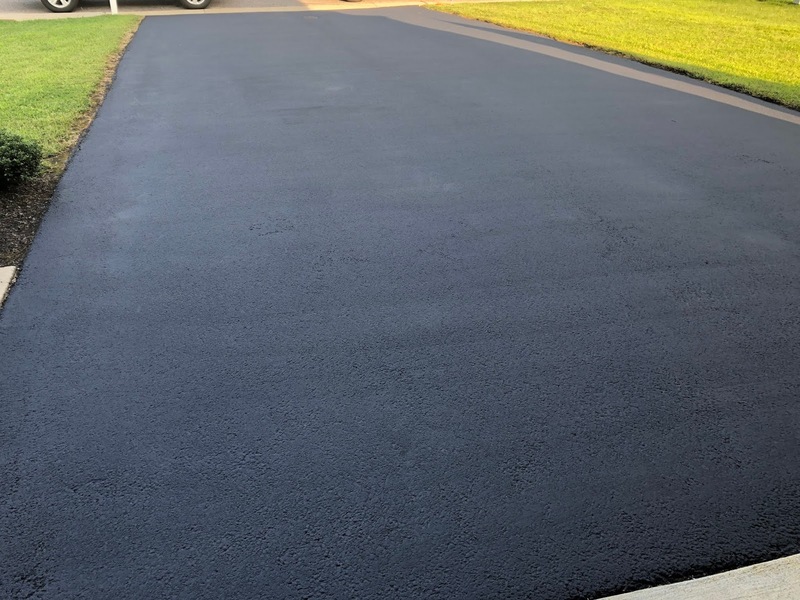 When we first moved into our house we were told the driveway needed to be sealed within the first year and then every two years or so thereafter. Three years ago I went the DIY route with the initial seal. It wasn't terribly difficult but it did make a bit of a mess and I was disappointed with how long the coating ended up lasting compared to some of my neighbors that hired someone to do it for them. This time I opted to pay someone to do it. I had discovered in the past few years that what some of my neighbors paid to have it done wasn't much more than what it cost me to do it myself. So I asked around, found a local company with good reviews, and arranged for them to come by. It ended up being about $50 more expensive than what I spent last time, took far less time, and looked nicer afterward. A crew of three showed up early one morning, cleaned the driveway, applied the coating and left, all in the span of about a half hour. As much as I prefer going the DIY route to save a bit of money, this is one I'll leave to the pros from now on. © 2014 Jeff Rew. Simple theme. Powered by Blogger.